Furniture beetles exist throughout the entire United States. They live outside feeding on many types of plants. During the summer months, when populations are most active, they will find their way into homes through windows and open doors. This article will discuss furniture beetles that target fabric and each carpeting, couches, chairs, drapery and other fabric items found in the home. Furniture beetles can fly so it is easy for them to get inside. It is not known why they seem ready to get into our homes, but it is suspected there are certain scents or odors which lure them. Like the common house fly, furniture beetles seem to know when doors or windows are open. If they enter at this time, they are usually looking for a place to lay eggs. Adults which have fed during the summer months mate and females will spend their time laying eggs. All types of furniture beetles resemble lady bugs, but are smaller – about 1/3 to 1/2 the size of a lady bug. The coloration of furniture beetles vary. Like snow flakes, it is not likely you will find similar patterns on specimens unless they are gathered from the same home. Only then is it likely they were from the same crop. Their color may range from light to dark. You may find some with different colored spots on their wings. Some are solid in color. Although their look and coloration vary, a trained eye can properly identify them. Once inside the home, female furniture beetle will look for a place to lay eggs. She will lay 50 to 100 eggs on surfaces that she feels will provide good food for the larva when they hatch. Larva are the stage which cause all the damage. They eat just about anything. Common food includes carpet, furniture, clothes, drapery, pet or human hair, antiques, and just about anything which is made of or has natural material in it. For example, most synthetic carpets have some natural content mixed in during the manufacturing process. Furniture beetles have been observed living on such fabric although the natural materials added to the fiber was only 10%. This ability to find food will enable them to live on many items throughout the home. Most people will find pockets of adults or larva. This is common on the underside of furniture, along the baseboard where carpet meets molding, under area rugs, or in closets. Furniture beetles only lay eggs once a year, although established populations in the home may do so twice. Adults live 2-4 years, so they are capable of laying several hundred eggs during their life span. Since they seem to attracted to light, there is no real pattern to how or where they may infest a home. You may find a pocket nesting in a piece of furniture and then another upstairs in your closet. These pockets could have been formed by different beetles coming into the home or an adult could have left the furniture downstairs and found it’s way into the closet. Because of this random behavior, it is necessary to treat all the carpeting to insure none are avoiding control methods. Many people will make the mistake of not treating certain areas or furniture. This is not recommended. Though you may have only found a few in one area of the home, it is likely others are elsewhere. Since they like to live deep in carpeting, it is hard to find every place they may be residing. The most frustrating type of infestation is one which is thought to be in a closet. Most clothes which are found to have a hole or two chewed in them are immediately diagnosed as having been eaten by clothes moths. In fact, it is much more likely the insect causing the damage is a furniture beetle. Moth infestations are easy to identify because you will find adult moths flying around the clothing they are infesting. You will readily find adult moths, pupa casing or cocoons and larva in your clothes. They tend to stay where they are feeding. Furniture beetles are different. Once the larva feeds, they will generally move somewhere else to pupate. They won’t move far, but they usually won’t stay in the clothes either. This is important when treating. Controlling furniture beetle infestations can be difficult. This is true for several reasons. First, they are likely to be active in small areas but there are usually several such areas throughout the home. Second, they tend to be active in hidden areas. Unlike roaches, ants or flying pests, furniture beetles feed and nest out of sight. Though most pests learn to hide out of sight, they tend to feed where we are likely to see them. 1) Be sure to treat all carpets. Though your main carpeting may be synthetic, it can likely feed furniture beetles. 2) Don’t ignore area rugs. These are readily infested since they are more likely to have more natural fibers. Be sure to turn the edges up and try to treat 2 feet in on the bottom side if not the entire bottom. Larva will feel right at home under area rugs and if you see some on top, there are probably more on the bottom. 3) Treat all fabric woven furniture. Be sure to turn pieces upside down and get the bottom. If the light fabric on the bottom is hanging low or is torn, spray inside the piece. Larva and adults will readily seek such places. 4) Don’t skimp on chemical applications. Because furniture beetles tend to be deep in carpeting, it is important to have the product penetrate. If you disperse the amount necessary to treat a given area over a larger area, it may not get down deep where it needs to be. This will make the whole treatment ineffective. 5) Since eggs and pupa are impervious to the chemical treatment, they will continue to live. After 30 days, they may hatch and live as if you never treated. This is why you must treat at least twice. Depending on the product used, you may need to treat once every month for 4-6 months. More about these options will detailed below. 6) Clothing where infestations have been discovered need to be inspected. Though you can spend a lot of money laundering all your clothes, it is usually not needed. Take a vacuum to all your clothes for a quick and effective way to remove adults, larva, eggs or pupa. Be sure to throw away badly infested pieces. 7) Do a thorough vacuum of the home before treating. This helps because it will remove some of the beetles as well as get them lifted up or moving where they are active. Your treatment will prove to be more effective if they are stirred up. Now that you have vacuumed and allowed for access to furniture and closets, you are ready to treat. Treatment is done with one of our SPRAYERS. Be sure to use one which has a nozzle that sprays in a flat fan. This means it comes out much like the way a paint brush applies paint – in a pattern which is uniform and constant. Nozzles which spray inconsistently will not allow the product to be uniformly distributed over surfaces. This will lead to areas not properly treated which will let the furniture beetles live. There are several types of chemicals which that can be used for furniture beetles. 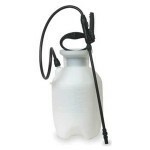 For mild infestations, use PERMETHRIN. It has no odor, is easy to mix and will last 2-4 weeks. This product is the safest to use as it is used on pets and people for other insect control. Widely used for fleas, Permethrin can be sprayed on carpeting, furniture and other places where people and pets will routinely sit. Another product which will last longer is DEFENSE. This is a material which is “time released” and generally will provide a solid barrier for 4-6 weeks per treatment. 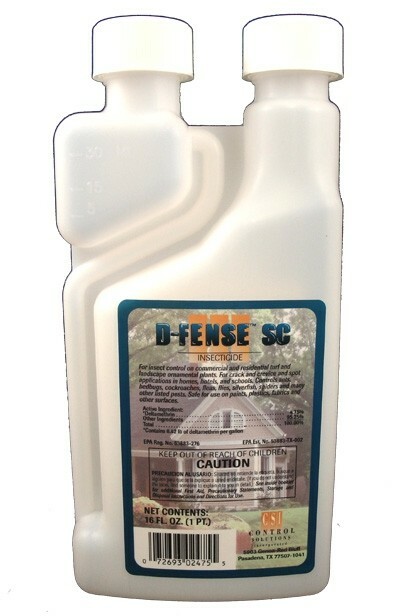 Defense is odorless and highly effective for many pests making it a good choice for inside spraying – especially furniture, rugs, etc. 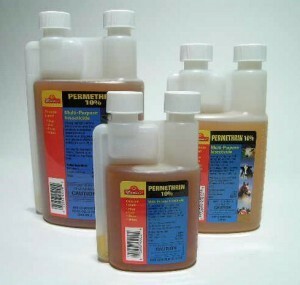 You will need to do 2-3 treatments a month with the Permethrin when furniture beetles are active but only once every 1-2 months if using Defense. Treat every month for at least two months to insure you have control of the hatching eggs and pupa. Although most will hatch in two months, they are able to live longer and because of this, it may be necessary to treat every month for 4-6 months to get complete control. Every case is different. In general, two treatments will resolve about 50% of the homes treated for furniture beetles. 4-6 treatments are needed for the other 50% of the homes. This is why some pest control companies will charge $500.00 to $1,000.00 to do a job. It is very likely they will have to come back to the home several times. Another product that can be added to the tank mix when treating with any of the above adulticides is INSECT GROWTH REGULATOR. This is a hormone which is labeled for many pests. When added to the tank mix for insect control, it will stop larva insects from developing into adults. Since the above adult formulations only last about a month, adding a growth regulator will definitely enhance your treatment and get you longer protection without doing any extra work. 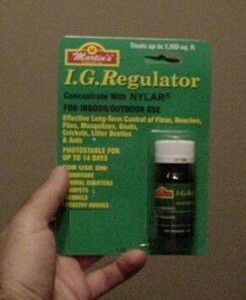 Growth Regulator lasts 3 months and helps to stop the likelihood of reinfestation by controlling young furniture beetles before they can grow into reproducing adults. And since there are so many locations for eggs to hide, every tool you’re able to add to your arsenol can make the difference between success and failure. Unfortunately, liquid sprays are not always well suited for all the areas furniture beetles may be active. Remember, eggs and adults will many times be up and under furniture, hiding below seat cushions out of sight. These sensitive areas are difficult to treat using a liquid. Better suited for the job is either a dust or aerosol. For the underside of furniture, nothing beats a light dusting with some DELTA DUST. This product is light and much like baby powder. Use a CRUSADER to apply some up and into the spaces and voids where furniture beetle larvae love to forage. Dust treatments can last a long time, maybe 6 months or more, and really work well when used in certain locations. For the top side and exposed sections of furniture, a light treatment with the aerosol BEDLAM PLUS will help. 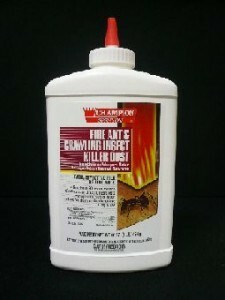 It’s easy to apply, uses Permethrin as the active ingredient and dries invisible when used properly. Excellent for mattresses, chairs, couches, rugs and most any fabric you don’t want to dust or spray with a liquid. Another tool to employ are some traps/monitors. We have two kinds which can help monitor your problem and though neither are a “solve all”, they should be deployed with most furniture beetle control programs. 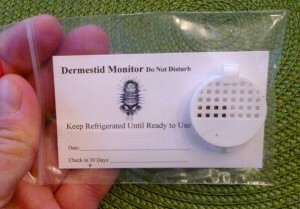 The first is our DERMESTID MONITOR. These “half dollar” sized discs are full of a food lure furniture beetle larvae love to eat. These monitors will attract larvae from several feet away. Set them in sensitive areas where you didn’t spray and they can serve as an early warning system to missed areas that need treatment. Dermestid Monitors are NOT traps so any larvae you see foraging around, on or inside the discs need to be removed by hand. But since furniture beetle larvae are slow moving, caterpillar like creatures, they’re easy to control and restrain (and they don’t bite). 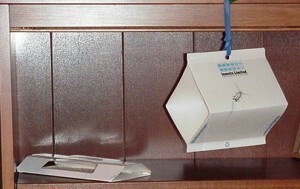 For adult beetles, we have two kinds of traps available: Hanging or Low Profile. The hanging style can be set out around windows or large open areas where adults have been seen flying. Low profile traps should be deployed on furniture, carpets, rugs and other locations that are flat. Keep in mind that unlike the Dermestid Monitors which will attract a wide range of larvae, the pheromone traps are specific to either VARIED CARPET BEETLE or BLACK CARPET BEETLE species. This means you need to know which you have or get a mixture of both kinds. These traps will remain active for 1-2 months and should be set throughout the home. Furniture beetles will usually get “in the mood” 2-4 times a year so in general, there will be one month per quarter where the adult beetles should be attracted to the traps you set out.